Keitaro, Naru and Mutsumi take the entrance exam for Tokyo University for what seems like the millionth time. After falling asleep during the exam, Keitaro is convinced he`s blown it once again and accepts the offer of a job on the South Sea island of Pararkalese, leaving town before the exam results are announced. 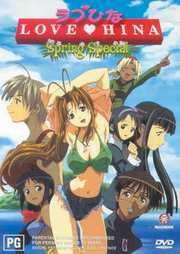 Naturally, Keitaro`s friends are worried about his mysterious disappearance, although Naru is reluctant to reveal her true feelings and tries to hide her concern. Anime craziness!